Lawmakers are accusing Iran of violating the recent nuclear deal due to the Islamic Republic’s test firing of a ballistic missile, which is likely at odds with international agreements barring such activity. Anger on Capitol Hill is mounting following Iran’s ballistic missile test, with many also expressing frustration at the Obama administration for failing to condemn Iran or threaten repercussions for what they view as a clear violation of the nuclear accord and United Nations resolutions. "The ink isn’t even dry on President Obama’s nuclear agreement and Iran is already breaking rules," Sen. David Perdue (R., Ga.) said on Thursday. "This should not come as a surprise to anyone since Iran has cheated on every deal." "There is no doubt they will continue to ignore the international community and behave like a rogue nation even after President Obama’s dangerous deal is put in place," Perdue said. "Americans expect our nation’s commander in chief to demand adherence to all international agreements, instead of allowing Iran to act aggressively without facing serious consequences." Many are calling for the Obama administration to reimpose sanctions on Iran as punishment for the ballistic missile test. Recent statements by Iranian officials indicate that President Obama will still announce the removal of sanctions at some point next week. The State Department has made it clear that, like Iran, it does not consider a ballistic missile test to be a violation of the nuclear deal. Sen. Mark Kirk (R., Ill.), who recently petitioned the administration to clarify its stance on the missile test, said that the United States must hold Iran accountable lest the Islamic Republic believe it can continue to take rogue action. Kirk, along with Sen. Kelly Ayotte (R., N.H.), wrote on Wednesday to Obama, asking that his administration explain whether it would take action against Iran. The senators say Iran cannot be permitted to advance its missile program, which could eventually be used to carry a nuclear weapon. "This test furthers Iran's ICBM program. An ICBM is not tangential or unrelated to Iran's nuclear program," they wrote. "The sole purpose of an Iranian ICBM is to enable delivery of a nuclear weapon to the United States." "[T]his long-range ballistic missile that Iran tested last weekend likely improves Tehran’s ability to target Israel—our closest and most reliable ally in the Middle East," they continued. "A threat combines hostile intent and capability." The test also continues a pattern of illegal behavior by Iran, according to the lawmakers. "This latest violation of international law demonstrates Tehran's continued willingness to ignore its obligations," the lawmakers wrote. Kirk and Ayotte are asking the administration to say whether it will refrain from waiving sanctions on Iran as a result of the test. "Why does your administration continue to treat Iran’s ballistic missile program as an issue that is tangential—rather than central—to Iran’s nuclear program?" the lawmakers also ask. 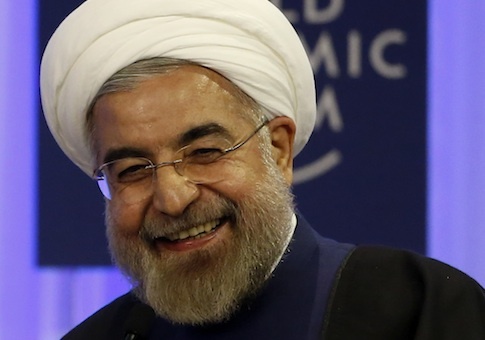 Iranian leaders say that on Monday Obama will announce the lifting of all sanctions on Iran. This would mark a change in the administration’s stance that sanctions should only be suspended, rather than completely eradicated. This entry was posted in National Security and tagged Iran, Iran Nuclear Deal, Kelly Ayotte, Mark Kirk, Nuclear Weapons. Bookmark the permalink.